Place your stores on Google Maps and make them SEO-friendly. Help your customers to find you easily. Show customers the location of your physical stores and how to get to you. Add images, opening hours, addresses and contact info. Optimize your stores for the search engines adding meta descriptions, keywords, and links. Get closer to your customers like never before. Do you have multiple stores that you’d like to place on Google Maps? And make them easily found for your customers? 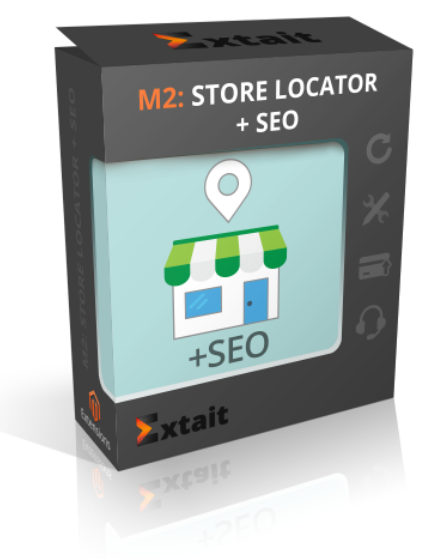 Our extension Store Locator + SEO hits the spot. With this, not only you can add as many stores or service centers as you wish to Google Maps but also optimize them for the search engines. The extension adds a separate link in footer e.g. ‘Our stores’. On a single page, your customers can browse all your stores and view a quick info about each one like opening hours, address, and contact phone. You can add an image to each store so that your customers would know how it looks in reality. They will surely want to drop in if you show them how beautiful your store is. At the store’s page, customers will find detailed information about a chosen store like its description, address, contacts, opening hours, and more. The location of each store is shown on Google Maps with a label. Prospects can zoom in /out and plan their route in a street view mode. Or you can give them your own instructions in the ‘How to find us’ field. To make your stores easily found both for your customers and the search engines, you can add URL key, meta title, meta description, and meta keywords. This feature allows you to significantly improve your store visibility and reach the target audience from a needed city. When a customer types in Google search “[your brand] store in Denver” a link to your store in Denver will come top of the page. Or at his fingertips, if he searches via mobile. Add as many stores as you have. Enable/disable them or make the necessary adjustments quickly via an admin panel. Your customers will find you wherever you are. With our extension Store Locator + SEO, it’s easy to show them the route.